Intuiface cares about only one thing: the total number of pixels stretching from right to left and from top to bottom. The physical dimensions and the number of displays is irrelevant. When creating a project, remember that dialog asking for your new project's name, storage location and resolution? That resolution section is what I'm talking about. Let's say you're creating an interactive digital sign that will be one Full HD display wide and three Full HD displays tall. That means 1920 pixels wide and 1080+1080+1080 - or 3240 - pixels tall. Create a project in Composer and in the Target Device Resolution section, choose the Custom option and type in 1920 x 3240. Go ahead and build your experience. Notice how Composer has created a scene with the pixel resolution you've just specified. Add your content as you would with any other project and hit the Play button to test your work. Your project will show up in just the main display - but don't despair. Hit the F11 key on your keyboard. Boom! All three displays are filled in with your one experience. To be honest, I have skipped a step, a step independent of your use of Intuiface. You need to tell the Windows operating system that a multi-display setup will be used, something much easier with Windows 8.1 / 10 than with Windows 7. Again, this step is not Intuiface specific so don't blame us. To keep it simple, the directions for configuring Windows 8.1 / 10 with multiple displays can be found in this article. In fact, bookmark that article for future reference. It covers everything we've just talked about. 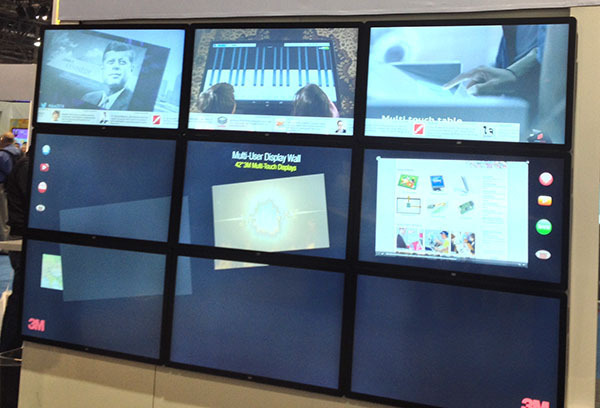 Now you know how to create a multi-display interactive experience with minimal effort. Maybe for your next project you could be a little adventurous and try it yourself.